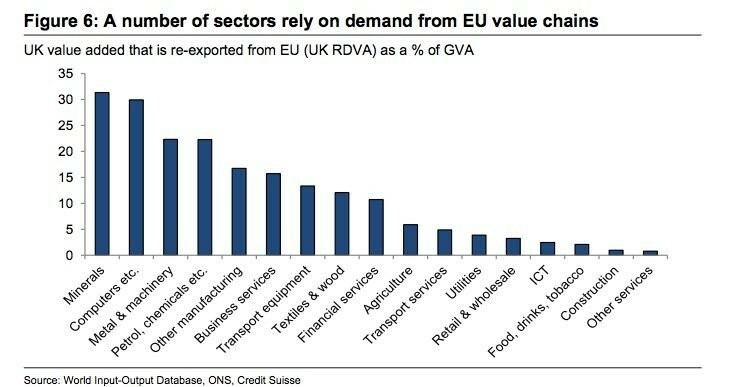 Credit Suisse has produced a handy graphic showing which European Union members buy the most British-made goods. The size of each pie chart represents the total monetary value of British exports to each country, while the percentage underneath is that value as a percentage of the country's GDP. The dark blue segment of each pie chart is the proportion of UK imports that are consumed in that country. The rest are re-exported to other countries. As you can see, Ireland, Germany, Luxembourg, Belgium, the Netherlands, Denmark, and Sweden are some of the biggest consumers of UK goods. The investment bank produced the graphics in a note titled "Brexiting the supply chain" sent to clients on Thursday ( in which it also discusses the impact of the fall in sterling on exports ). In it, economist Anais Boussie and her team look at what impact Britain's withdrawal from the European Union will have on UK exports. 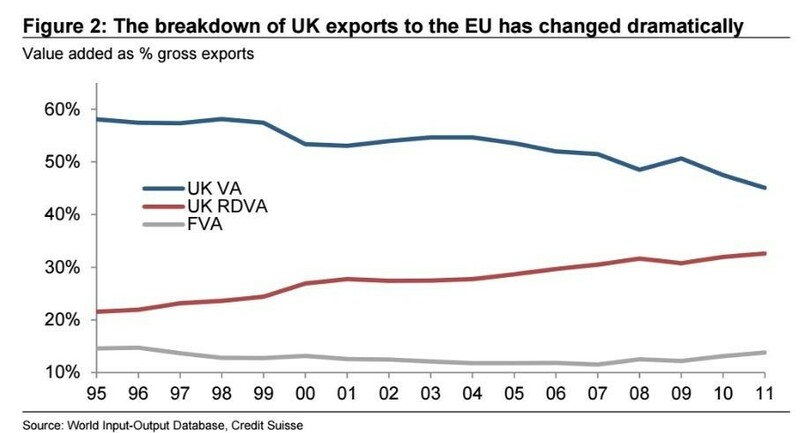 One of Credit Suisse's biggest points is that the nature of exports have changed a lot of the years since Britain joined the European Economic Area, as it was then. Rather than simply shipping British-made goods to the continent to be sold there, raw materials for UK products are often imported from elsewhere. Similarly, British-exports to the EU may not represent their final destination. The UK could ship a car door, which is then attached to the full vehicle in Germany and then sold on in Africa (this is just an example). As you can see, industries like computers, mining, and petrochemicals see over 20% of their exports to the EU re-exported on to other countries. 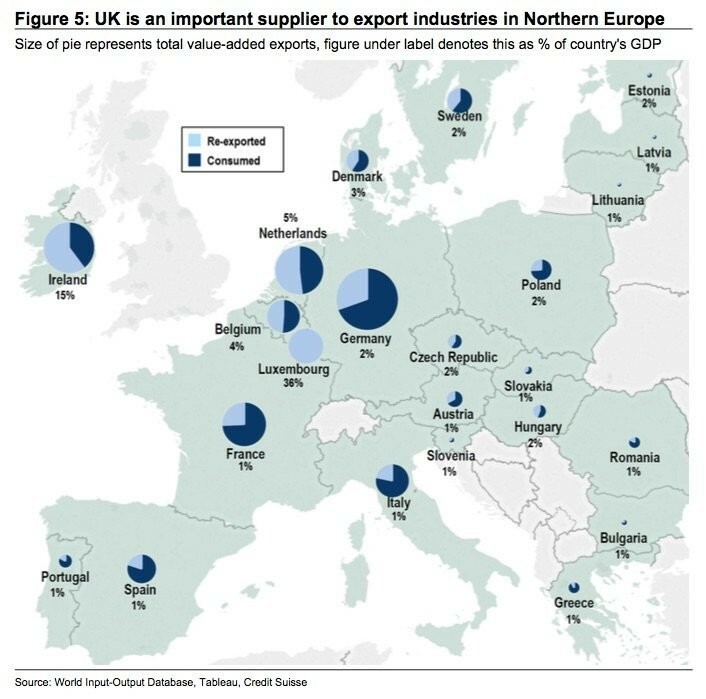 This could be seen as a good thing: the UK is embedded in the production line of various EU countries so it will be difficult and costly for the likes of the Netherlands and Belgium to extricate themselves. "Inasmuch as these supply chains have grown and matured in the environment of the single market, there’s a very real risk that leaving the single market would lead these supply chains to wither. "Indeed, the risk is that the current uncertainty surrounding the UK’s membership of the EU may be sufficient for some EU companies to slowly shift sourcing parts of their value chains away from the UK. As such, the negative effects on UK export demand may occur sooner rather than later." This would be a disaster for many UK industries, as many have "become increasingly specialized in goods and services that add value to the production of EU exports, rather than producing final goods and services." Many of these sectors and businesses are now inflexible, set up to produce specific parts for EU buyers who need them as part of a supply chain. Finding new buyers could be challenging.